The return of a real classic - for the first time on Steam! 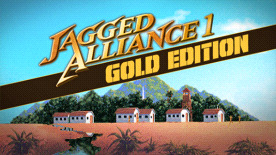 20 years ago, Jagged Alliance made an impact and changed the strategy genre forever. Now you can experience this legend in its glorious original form. A desperate call for help from the island Metavira: The scientist Jack Richards and his lovely daughter Brenda are reaching out to you. The Fallow trees and thus the precious, medical sap on which countless of lives depend, are under the control of the evil and traitorous Santino. That’s why Jack and Brenda hire you, the commander of a mercenary force, to put an end to Santino's insane plans. © bitComposer Games, 2014. bitComposer Games is a brand of bitComposer Entertainment AG. Developed by Madlab Software and Sir-Tech. All other trademarks are the property of their respective owners and used under license. All rights reserved.